Me: You are here. It is represented as [x, y, z] which is [-219, 54, 453]. Me: So, where are you? Me: No! Where are you in space? Son: I’m not in space, I’m on the ground. Me: No! What are your coordinates? Son: Oh, it’s [x, y, z]. Me: No! What are your number coordinates, in space? Son: Oh, it’s [-219, 54, 453]. But I want to teleport over there. Me: But over there needs coordinates. That is [-200, 55, 450] and here is [-219, 54, 453]. Son: Ok, I got it! We looked up how to enable the debugger, and this opened up a whole new world for him. All the coordinates appeared in realtime, so I think he’s going to go crazy building teleporters this weekend. PS3 Firmware v1.80 on Flickr – Photo Sharing! The latest firmware update allows PS3 to act as a client for DLNA-enabled Media Servers. Since I don’t have a DLNA enabled device, I’m running TwonkyVision Media Server. This software DLNA media server supports XP, OSX, Linux and a long list of embedded NAS devices from all your favorite brands. Whatever they were smoking to come up with that name, I want some of it. Finally, a decently priced palm-sized motherboard for the DIY crowd. Seen on Engadget. This is just the thing to make Samsung start shipping their units (for real). Samsung’s SSD was announced way back in May of 2005 and nothing has materialized since then other than demos at trade shows. I know Sandisk really delivers. The special news here is that Sandisk plans to sell these disks in the $600 price range, making it super cheap by SSD standards. That’s cheaper than my idea of using two Extreme IV 4GB cards in a RAID (via IDE-to-CF adapters) as a “poor man’s SSD”. Way to go Sandisk. Compiling Asterisk on the PS3. Running a PBX from your Playstation 3. PC200086 on Flickr – Photo Sharing! This is for anyone who might be interested in using the PS3 game console as a VoIP server, running Asterisk. The console is quite pricy at $599, but as a dual-core, headless server possibly capable of hosting hundreds of free VoIP calls, it’s extremely cheap. I was able to successfully build Asterisk v1.2.14 on the Sony PS3 running Fedora Core 5 and the Cell Addons for SPU support. The basic steps are pretty simple and I’ll detail them in another post. If you are anxious to try and build it, just comment out “chan_phone” out of the Makefile and it will compile to the end without error. This machine needs to share time between Linux and Resistance:Fall of Man, so I hope you understand if I don’t get back to this post soon. I do intend to run a full SIPP load test against this “server” and post my findings. As a point of reference, I’m running another Asterisk box on an Compaq Presario (AMD64 3500/512MB) running TrixBox. The system cost us $599 coincidently, and maxes out at 350 concurrent calls before hitting 100% CPU utilization. I have no idea how the PS3will perform, since it only has 256MB (but XDR memory is supposedly faster than DDR3) — we’ll find out in a few days. I know this is an apples to oranges comparison, so the only common denominators are the Asterisk source code and the price of the machines. I can try to do some more useful tests or monitoring if people have some suggestions. Gamestop kit on Flickr – Photo Sharing! Terra Soft — Linux for PS3, IBM Power, Mercury Cell, and Apple PowerPC. Not surprisingly, the PS3 is relatively easy to get now that Sony has quadrupled its output. You’ve probably read all over the net that they plan to make their 1 million unit target for December, which means the PS3 should be 4 times more available than it was in November. I just received my console in the mail today. I got it from Gamestop (the 6-game bundle with extra controller). I’ll post some more interesting geek stuff with it after I install Linux and do some proper benchmarks. Keep checking this page for updates. 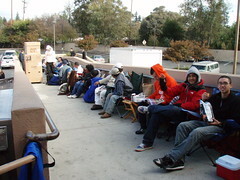 Some PS3 camping action across the Silicon Valley. Click on the link to see the rest of the series. Read the FAQ for more details. My display is rather old (a cheapo GEM 18″ LCD) which is getting crunky and spotty. It’s affecting my photography lately. Some of my photos are rather flat, not due to the subject matter but as a direct result of the post-processing editing on a poor display. I originally had my Nvidia digital vibrance turned up, and so I was developing my RAW images based on these boosted settings on the screen. This resulted in over compensation of the final image which looks flat on monitors without digital vibrance (practically everything from mobiles to the PC in the next cubicle). Windows Genuine Advantage update got you down? SilverStone LC18 with built-in LCD monitor and touch screen, oh my! Gigabyte announced a neat little device called the iRAM. Basically it is a PCI card with an external power connector and 4 DIMM slots. It looks and acts (to the BIOS and Operating system) like a hard drive, but is a completely solid state storage device. The user provides four memory sticks to populate the card with 4-8GB of memory which can then be loaded with your favorite OS or as a D: drive for Windows’ scatch disk. That is not so exciting unless you are a performance freak and know than all current solid state devices (based on DIMMs) cost thousands of dollars and have specific purposes for database cacheing. In most cases they are not bootable nor are the recognized as a disk without installing special software. The iRam is intended to be either a boot drive or a Windows pagefile so that disk-intensive operations like booting to the Windows desktop or loading large files are accelerated by orders of magnitude faster than traditional disk-based storage systems. (I’m talking 10x or better here). My last experience with a ramdrive was back in the 80′s when I used my 8MB system card to install and run the OS off it. It only lasted a few hours because everything dissapated after the power was cut when shutting down the system. Working with a ramdrive is like driving versus flying. Ram is fluid and all I/O operations are instantaneous, so the computing experience is raised to the next level. Computers respond instantly and file operations which used to take several seconds are reduced to milliseconds. Imagine sorting images and opening large directories in Windows XP without waiting. Or booting in a couple of seconds, just like turning on a light switch. Very cool. I regularly work with multi-terabyte Ultra320 SCSI fileservers (in optimum multi-channel configurations where the drives are load balanced and grouped according to theoretical BUS saturation) and the computing experience is still far from “realtime”. So let’s hope that this iRam device lives up to its claims. I’d like to see it bundled with some kind of a Ram-to-disk agent so whenever you shutdown Windows, it does a full image dump to a 2.5″ hard drive or CF card. I’ve had my fair share of disks going bad and the thought of trying to extract corrupt data from a failed RAMdisk is quite frightning to say the least. Here are some images of the iRam from a Chinese website. The Computex coverage all over the web has been regurgitated to death so I though this might be more refreshing. Based on the review over at anandtech.com regarding the iRAM (summary: bleh, wait for version 2) I think a better solution would be the Solid State Drive from Samsung. Since it is aimed at laptops and designed to replace hard drives wherever durable storage is needed, I would imagine it is priced accordingly (in other words, close to high performace hard drive prices and not astronomically high like current SSDs). Well, after alot of reasearch, I’ve found the best HTPC cases for my next Multimedia PC. Check out the X15E from Uneed. This runs for about $600 (cheap considering that a separate touchcreen LCD panel and aluminum HTPC case would cost more if you were to build it yourself). For those on a budget (like myself) the LC14M from Silverstone is great for the price ($250 with programmable VFD).